Picture Perfect Profits Review - All It's Cracked Up To Be? This is my honest review of Picture Perfect Profits, an Instagram video course by Jason BTO, Nathan Jurewicz and Trent Silver. I hadn’t heard of these guys until I came across the product and I was interested to know if what they’re offering is worth the investment. It’s important to mention that unlike other people out there that have reviewed Picture Perfect Profits, I’m not doing so with the sole intent of funneling traffic to some other offer I’m an affiliate for that I claim is “better”. I am an affiliate for just about all of the products I review, I don’t have an ulterior motive, and most of the time I have purchased and gone through the whole course before writing about it. This is a 100% honest review, something that’s not easy to come by these days. Summary: In regards to the content that is there, Picture Perfect Profits has some good content on strategies, techniques and practices for getting the most out of Instagram as an online marketer. Unfortunately though, while I came into it with high hopes, I ended up very underwhelmed and disappointed. This is essentially an unfinished product; the sales page claims there are more videos than there actually are in the members area. In the Facebook group for the product, Jason BTO repeatedly claimed that the videos that should be there will be added over time, but this has yet to happen and likely won’t ever happen. Additionally, the paid monthly service they provide appears to be dead, with no new updates or activity for at least several months. What is Picture Perfect Profits about? Grow Your Page – can be done using either free or paid strategies. The creators cover both of these strategies inside the course. Post Pictures – this is where you post cool motivational quotes in front of relevant images. Inside the course the creators tell you what types of pictures to use that are the most profitable, where to find good motivational quotes for free (copy and paste), and how to put your images together in an app and make them super sharp for posting to Instagram. Make Money – the creators go on to say that there are 3 ways to get paid instantly. The first is to sell shoutouts. Shoutouts are Instagram posts users with a large number of followers make that promote other people’s pages or other people’s links in the bio of their profile. The second way is to promote products to your follower base, and the third way (which is really just a form of the second) is to become an affiliate for them and promote their product. The creators say that when you follow their formula, you’ll have a clear path to wealth and prosperity. You also get some bonuses: Trent Silver’s Rolodex of private Instagram influencers with huge Instagram followings, 30 days free of Motivated Marketers Monthly, and enrollment in their affiliate program (not really a bonus, since you don’t typically have to pay for this, but whatever). 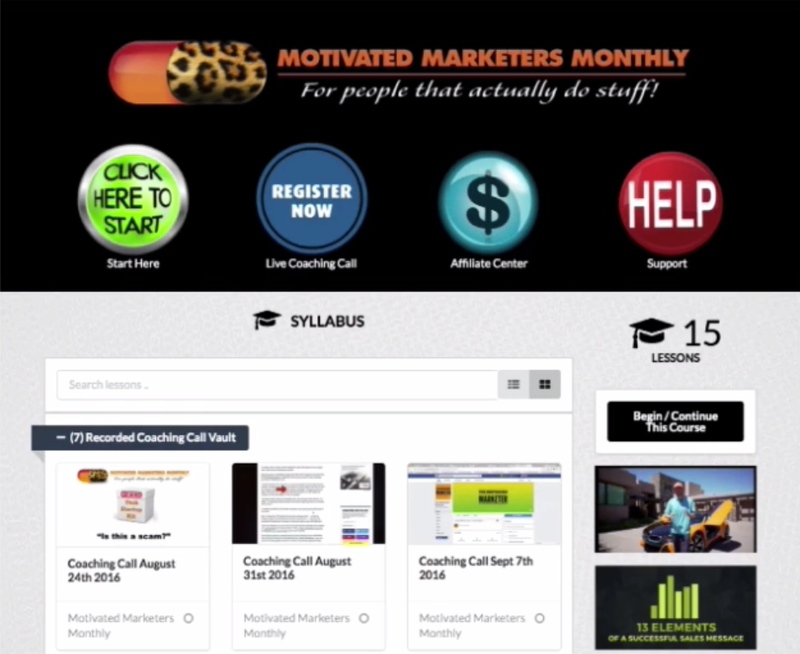 Motivated Marketers Monthly is an online group coaching program that shows you “how to sell things once and then get paid on a monthly basis”. What is the structure of Picture Perfect Profits? Picture Perfect Profits doesn’t have “upsells” in the traditional sense; rather, they have a main course area with all of the video modules, the “affiliate center” where you can get your affiliate link for the product, a support page, and the Motivated Marketers Monthly area, which has coaching calls, guides and other video resources. The main video page pretty much constitutes the entire course, and it’s here where the creators go into more detail about the three main steps I described above. You’ll also find extra links and other resources underneath many of the videos. Also in the members area is the link to Motivated Marketers Monthly, where you can access all the videos exclusive to that service. Is Picture Perfect Profits a scam? I would say no, but to be perfectly honest, it’s not too far away from being one. I’ll start with the positives: the course does have some good content that will put you on the path to success on Instagram if you follow through. I’ve been implementing the training that is there, and my Instagram page continues to grow every day. There is also a lot of useful video content in the Motivated Marketers Monthly members area, which I would recommend you absorb before your free trial runs out. Unfortunately, that’s where the good ends. For one, the members website is slow and ugly. Secondly, this is essentially an unfinished product. In the sales video the creators make it seem like there are 31 videos, but at launch there were actually only 20, and months later they’ve only added about 5 more videos. Videos on monetizing your followers and a few other things have yet to be released — it looks like we’ll all die of old age before we get our money’s worth from this product. Another thing is the Facebook group: in it, Jason BTO, one of the creators, spends more time pushing shady offers on the group members than actually supporting his own unfinished course. The guy clearly has moved on to other things, which is fine, but the least he should have done was communicate better with his customers and finish the damn product. Lastly is the paid service Motivated Marketers Monthly; since I bought the course and got access to it, I haven’t seen it get updated once! Quite honestly I’m skeptical that new content will ever get added to it, so I would highly recommend canceling your monthly payment plan before your free initial 30 days is up. Picture Perfect Profits is not worth $30 — not even when you take into account the “bonuses” that include the free trial to MMM. All things considered, this is something that should have been sold for less than $10. The reality is that a good majority of the information found in the course can be found by searching on Google. As I said though, there is decent value in this and the methods covered actually do work, so if you’re willing to make the investment (it’s up to you, really) then you can pick up the course HERE. I hope you found my review of Picture Perfect Profits informative and helpful. See my summary and rating of the product below. If you have any questions, feedback or comments, feel free to leave them in the comment section! Prev 2 Day Profits Review + Bonus – New Underground Method? Next Video Chief Green Screen Edition Review + Bonus – New and Improved?